Description: The Swedish King Gylfi, who is in disguise as Gangleri, presumably in the presence of Óðinn, who is represented in three forms as Þriði, Jafnhárr, and Hárr. This scene is from the Deluding of Gylfi in Gylfaginning in Snorri's Edda. This illustration is from the Icelandic manuscript that is now known as Codex Upsaliensis. Bishop Brynjólfur Sveinsson sent the manuscript to Sorö, Denmark as a gift for his friend Stephanus Johannis Stephanius in 1639. After his death, Stephanus's widow sold it to the Swedish Chancellor, Count Magnus Gabriel de la Gardie. Count Magnus Gabriel de la Gardie donated the Codex Upsaliensis to the Carolina Rediviva Library at the University of Uppsala in 1662. Images from Codex Upsaliensis are available with permission from Carolina Rediviva in Uppsala. Manuscript description and images. N.B. : The Deluding of Gylfin illustration (f. 26v) is on page 50. Uppsala: Carolina Rediviva. Codex Upsaliensis. c. 1325. Parchment manuscript. Codex Upsaliensis This manuscript is one of the four surviving complete manuscripts of Snorri's Edda. However, it is shorter than the others. It was created circa 1325 by an unknown scribe and is also known by its shelfmark DG 11 4to. 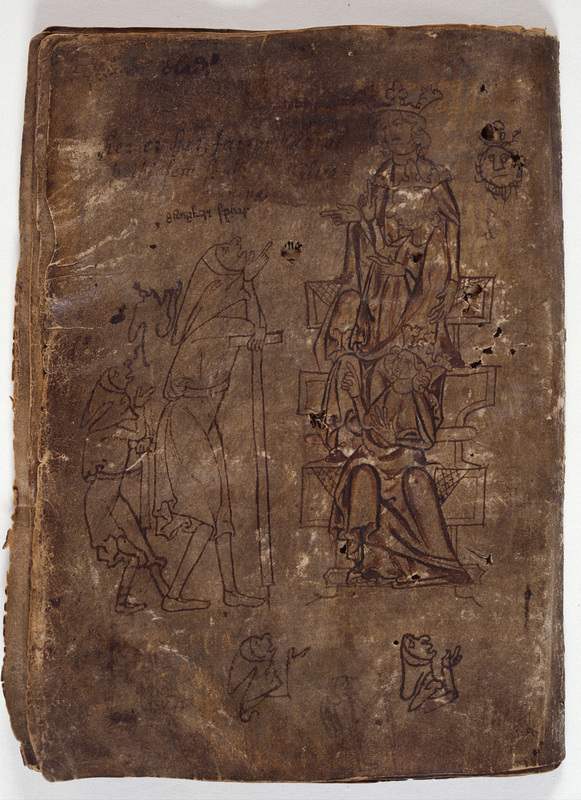 DG 11 Shelf mark for Codex Upsaliensis, which contains the iconic illustration of Gylfi standing before the three figures of Odinn seated on high seats from the Gyfaginning section of the Prose Edda.